Color photo of the Assembly in session in the Temporary Chamber, 1979. 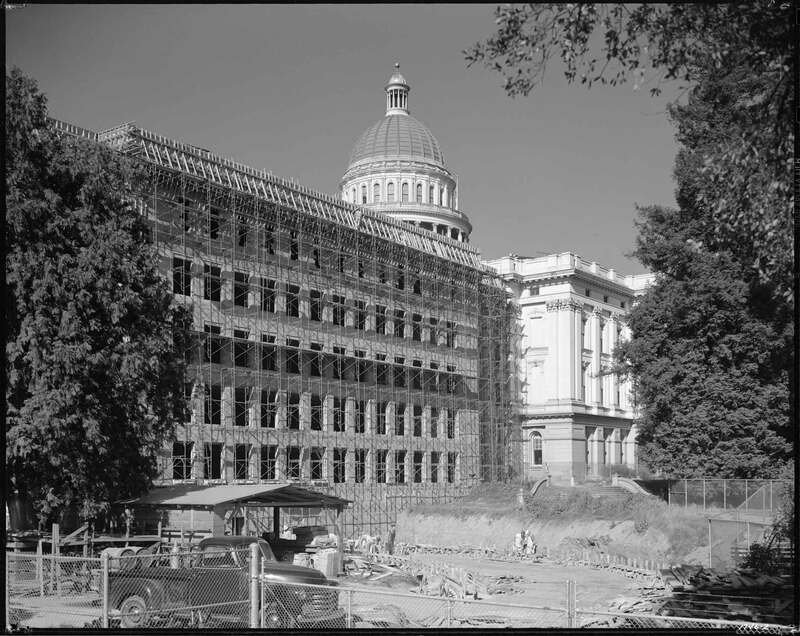 The Assembly met in these temporary chambers in Capitol Park during the Capitol restoration, 1976-1981. 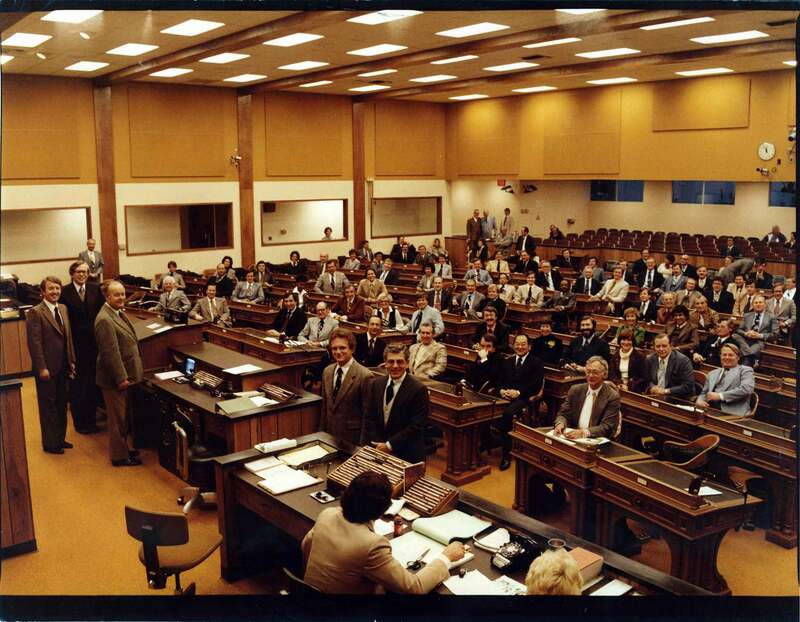 Photo shows Members seated at their desks on the Floor. Standing at dais: Speaker Leo McCarthy, Speaker pro Tempore John T. Knox, and Assistant Speaker pro Tempore Tom Bane. Capitol Annex under construction, May 1950. Exterior view showing steel beam construction of the Annex (black and white photo). 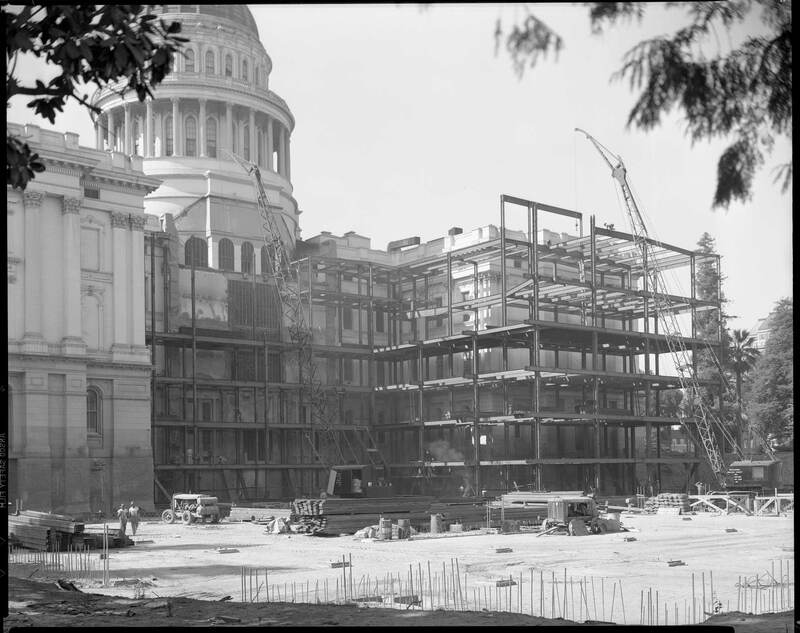 Capitol Annex under construction, October 1949. Former apse area exposed during erection of steel beams (black and white photo). 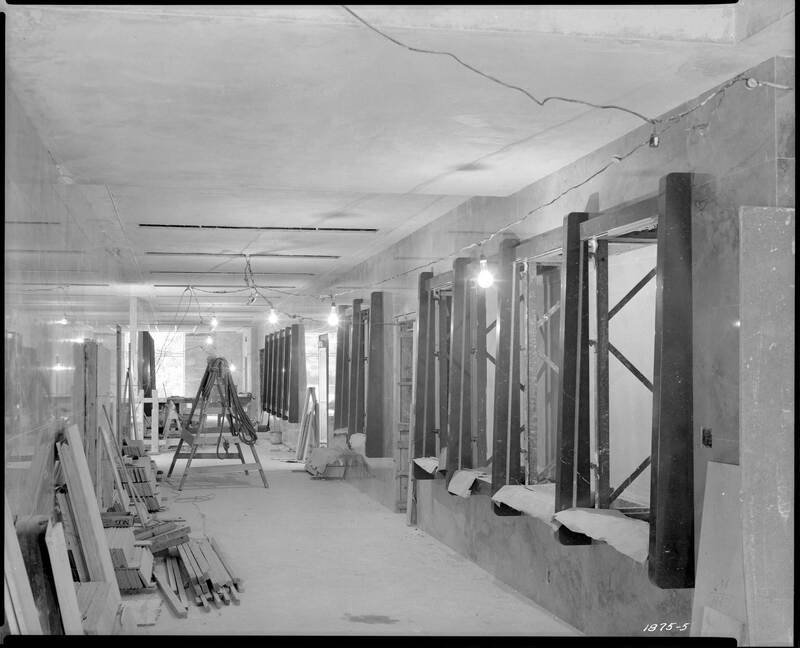 Capitol Annex first floor interior, showing county exhibit niches under construction, September 1950 (black and white photo). 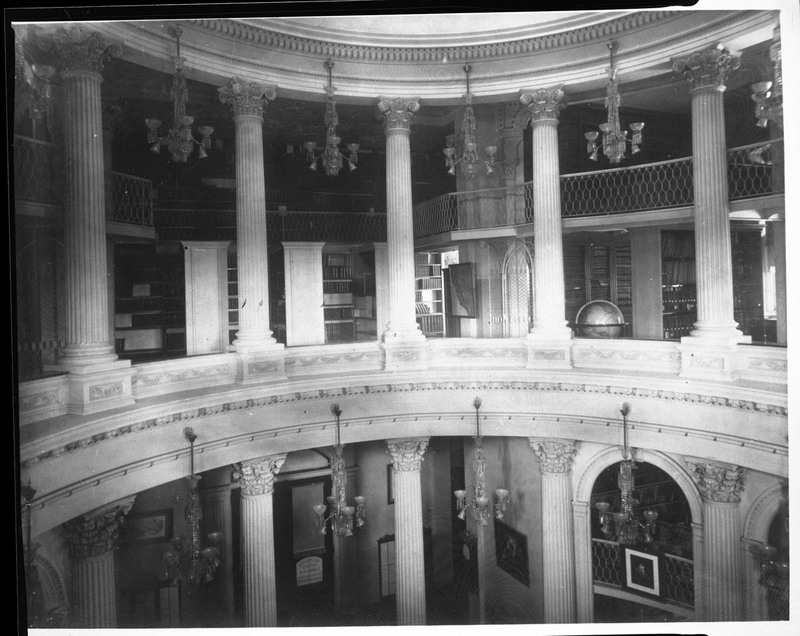 Interior view of State Library housed in the Capitol apse upper level, circa 1905. Female librarians pictured wearing Victorian era clothing. Paintings of Shakespeare and other literary figures hanging on wall (black and white photo). 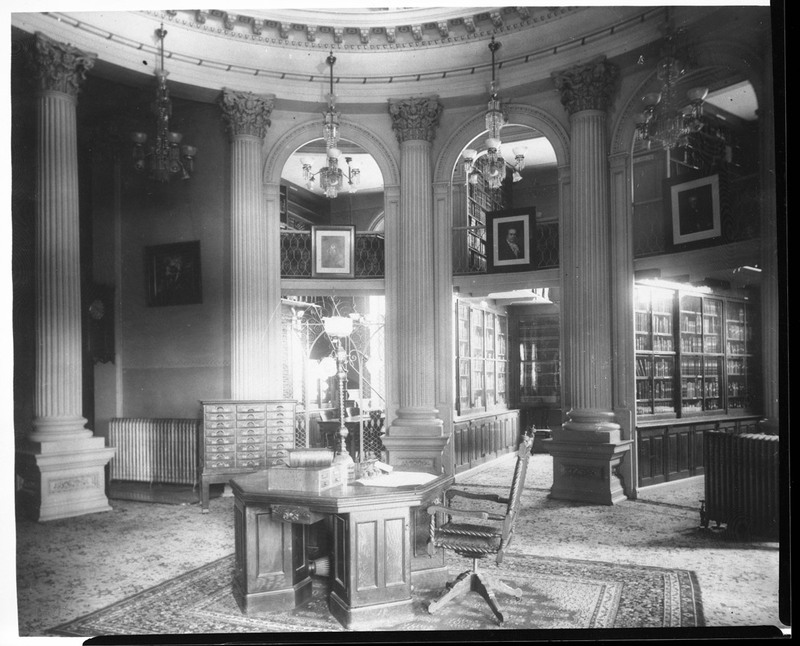 Interior view of State Library housed in the Capitol apse lower level, circa 1905. 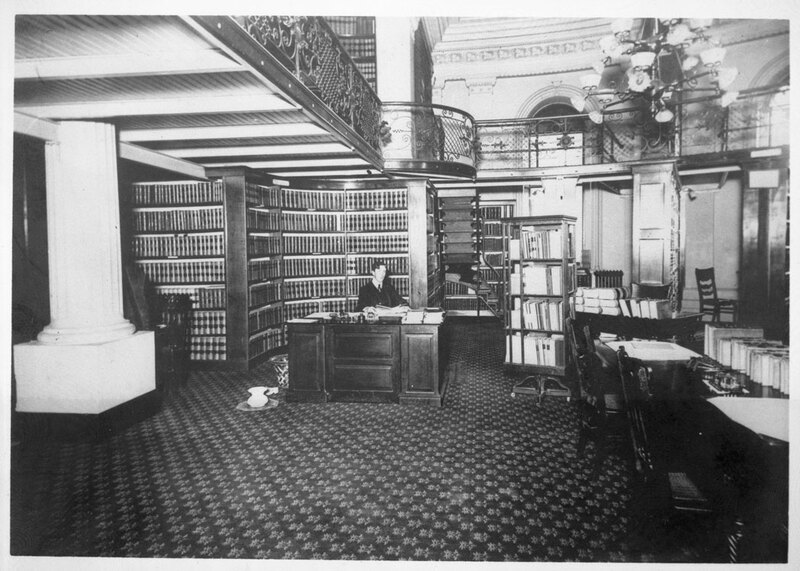 Male librarian pictured sitting at desk in area of the book “stacks.” Gas chandelier and ornate iron railings shown (black and white photo). 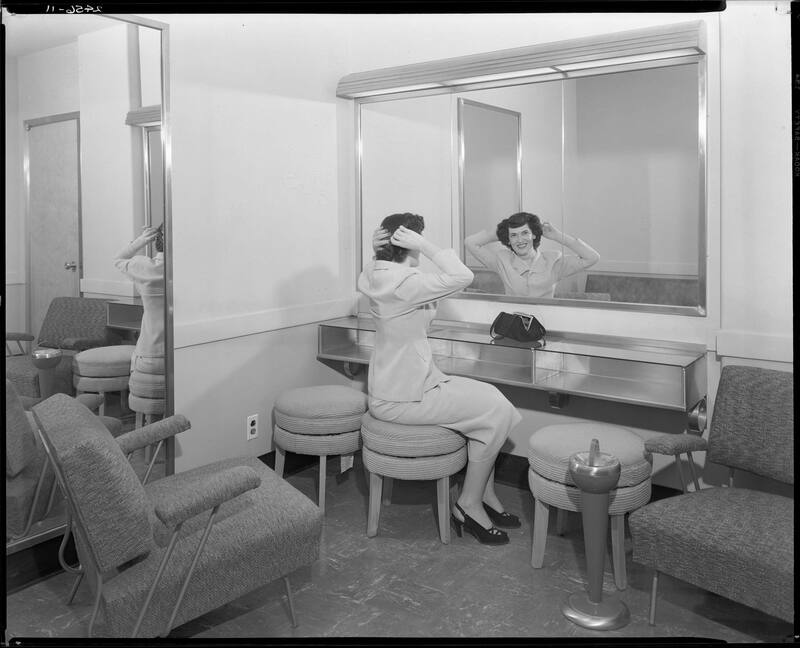 Ladies “powder room” in newly constructed Capitol Annex in 1952. Woman shown looking into mirror while seated in powder room, with purse on shelf. 1950s era furniture (black and white photo). Capitol annex office circa 1952. Female secretary shown at desk using typewriter. 1950s era office equipment, file cabinets, and furniture shown (black and white photo). View of the new Assembly Member’s lounge, circa 1952. 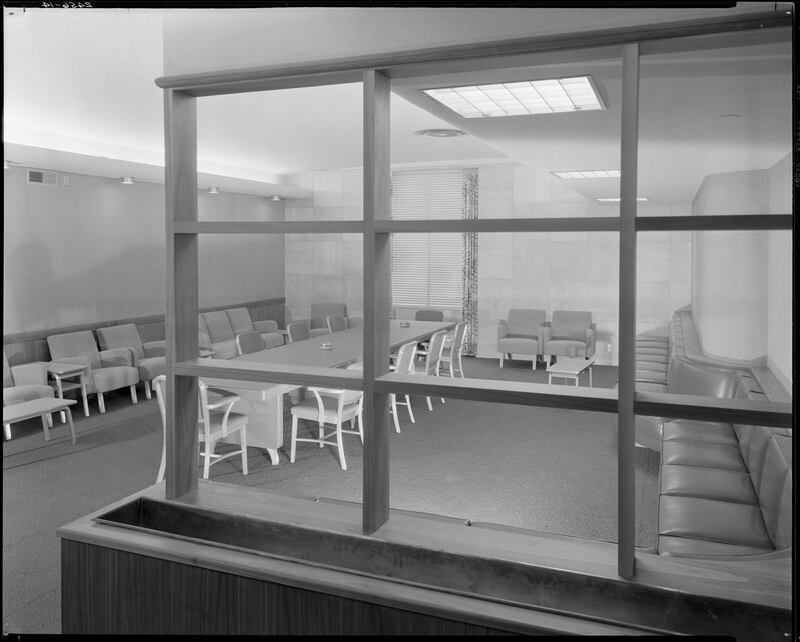 Pictured: long conference table with ashtrays, upholstered bench booth seating in 1950s style. Located on the Third Floor annex behind the Assembly Chamber. 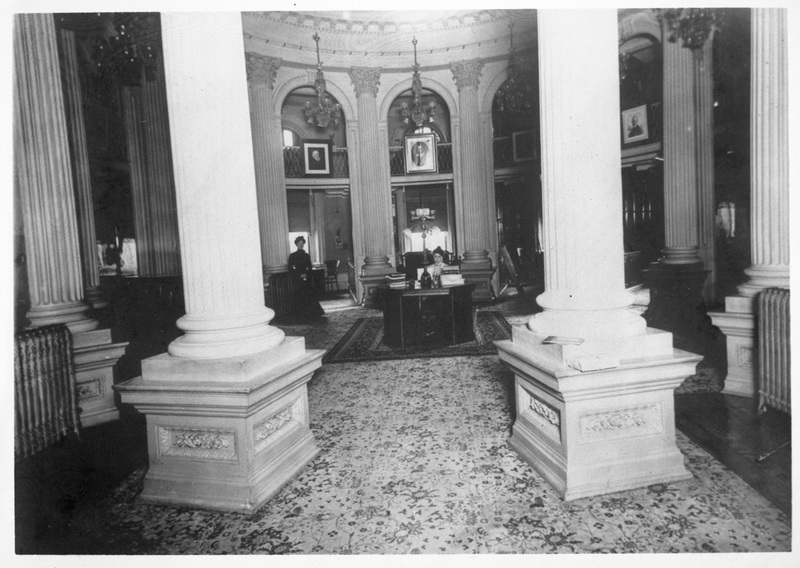 The lounge is where the majority party holds caucus meetings during floor sessions (black and white photo). 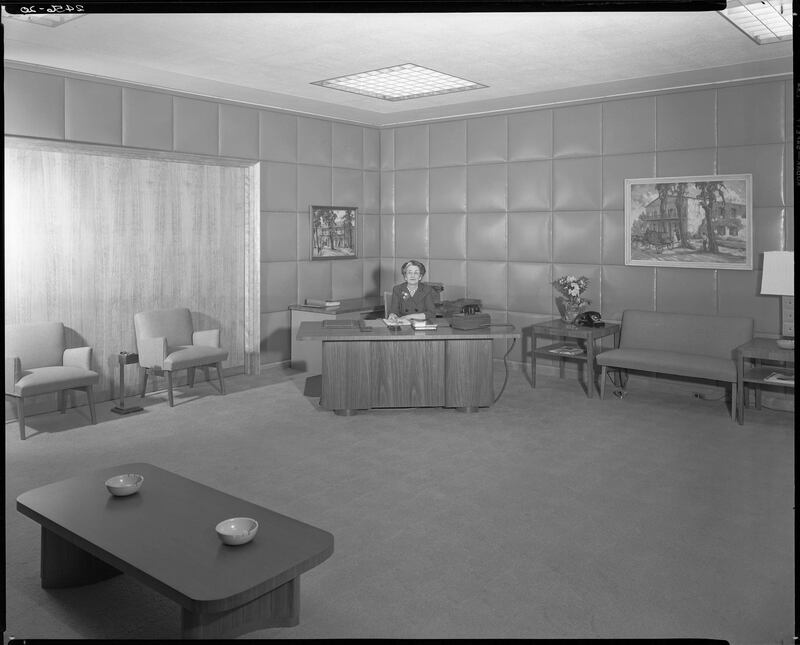 View of the Governor’s office public reception area, circa 1952. 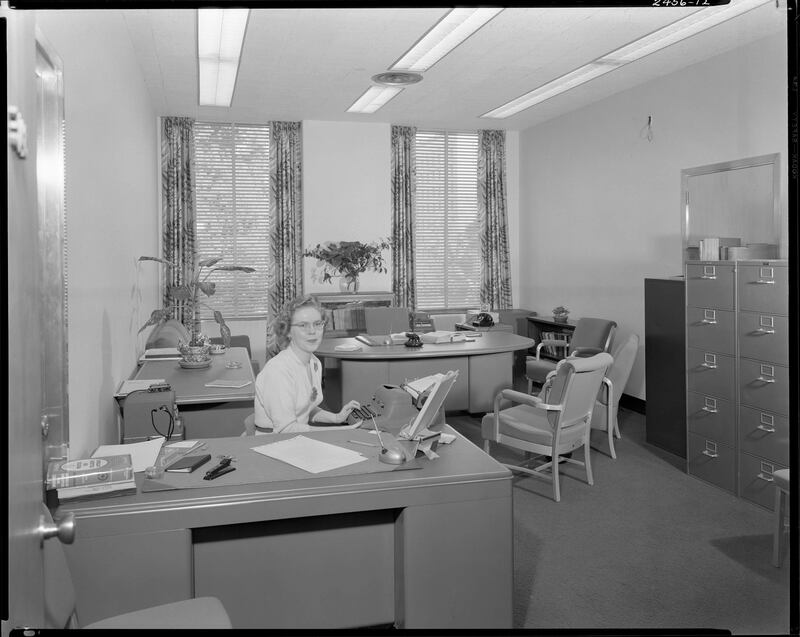 Female secretary shown seated at desk. Wall is box stitched upholstered fabric. Also shown: 1950s era furniture and multiple ashtrays. Governor Earl Warren resigned the following year when he was appointed as Chief justice of the U.S. Supreme Court on October 5, 1953 (black and white photo). 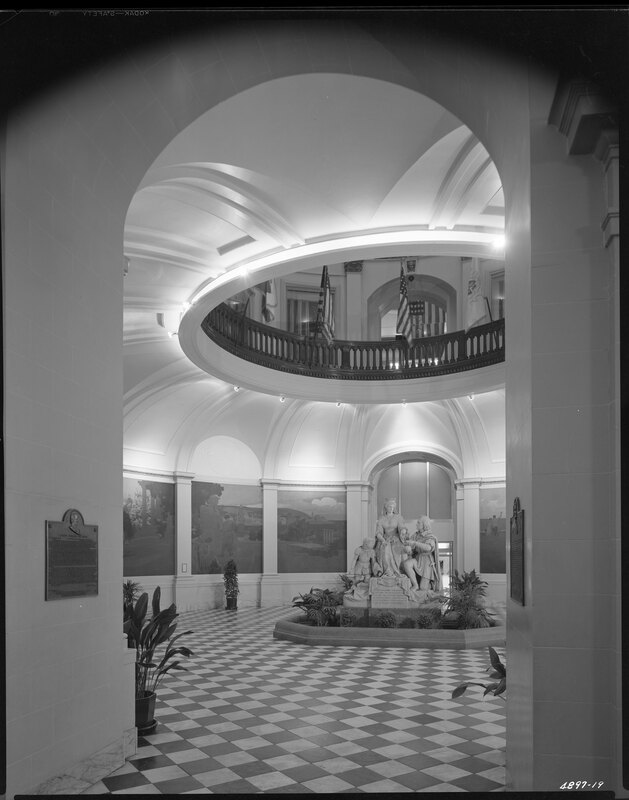 Interior view of the first floor State Capitol rotunda (circa 1952), showing entrance to the State Controller’s office. Large murals painted by Arthur Matthews from the Bay Area (mounted in 1915) are on the rotunda walls depicting California historical scenes. These murals were moved to the basement rotunda during the 1976-81 restoration. Checker pattern floor tile shown. Plain white paint shown on rotunda ceiling arches, illustrating how utilitarian the rotunda had become by the mid-20th Century (black and white photo). 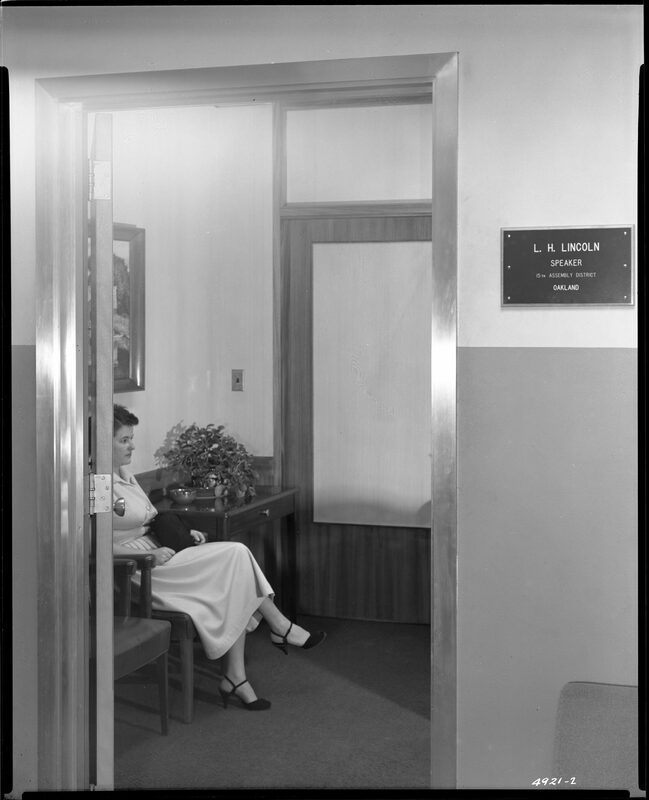 Photo looking in through the entrance door of the Office of Speaker Luther Lincoln (R-Oakland), circa 1955. Photo shows woman visitor seated in the reception area with purse on lap (black and white photo). 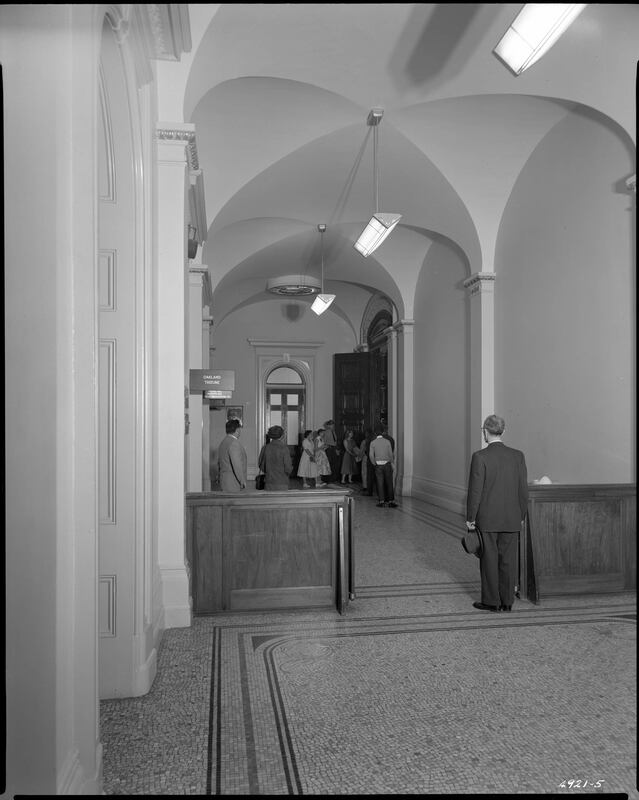 View of the hallway outside the main Senate Chamber entrance, circa 1952. State Police officer holding door open to admit citizens. Committee bulletin board on wall. Sign on wall directing visitors to public gallery on the Third Floor. Note the fluorescent lighting fixture (black and white photo). 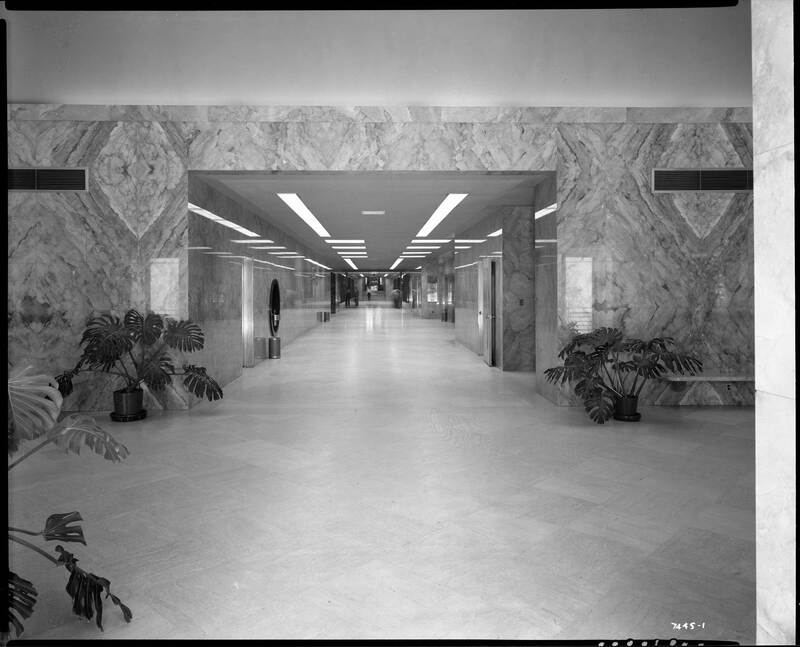 View of the hallway outside the main Assembly Chamber entrance, circa 1952. State Police officer holding door open as visitors peer into Chamber. Across from the Chamber doors note the press offices: Oakland Tribune, Fresno and Modesto Bee, SF and LA Examiner, and SF Call-Bulletin (black and white photo). View of the State Treasurer’s office on first floor of the West Wing of the Capitol, August 19, 1952 (per the wall calendar). Security glass sits atop long public counter, with slots to slide paperwork, checks, and cash. A large metal vault door is seen behind counter. 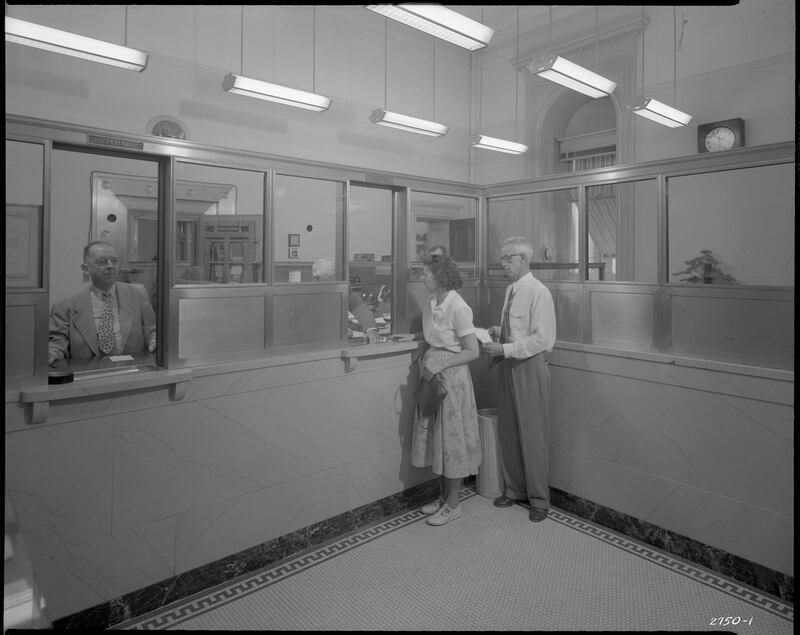 “Receiving” window is seen on the right (with two persons lined up to do business with a Treasurer staff person); and “Paying” window on the left, showing another worker at his post (black and white photo). 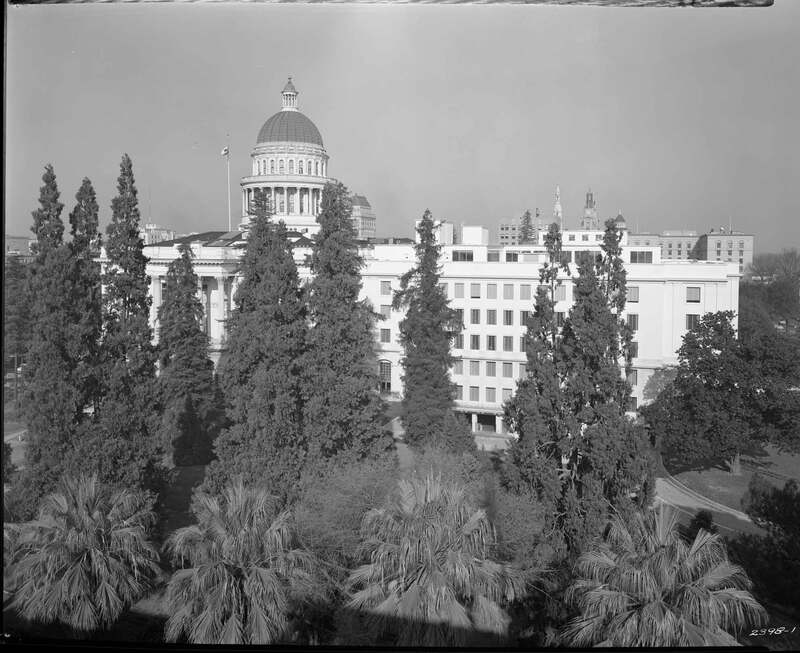 1952 photo of the exterior of the Capitol complex, taken from the top of a building at 12th and N Street, looking northwest toward newly constructed Annex. 1940s model truck seen in Capitol driveway. 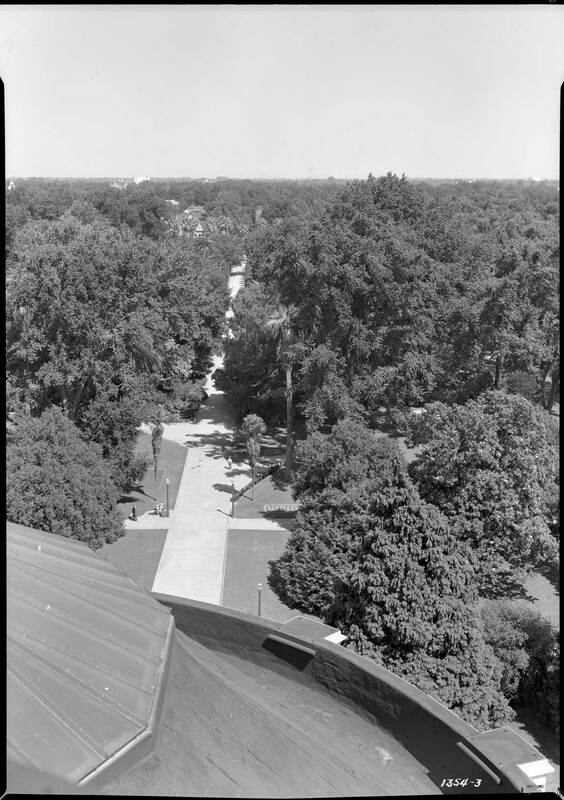 Good view of the tree canopy of Capitol Park in the foreground (black and white photo). Photo taken from public entrance on first floor rotunda looking toward the Columbus/Queen Isabella statue. Visible behind the statue is the newly constructed Annex hallway. On the left wall is a large bronze plaque entitled “Logan’s Memorial Day Order.” Large murals painted by Arthur Matthews from the Bay Area (mounted in 1915) are on the rotunda walls depicting California historical scenes. These murals were moved to the basement rotunda during the 1976-81 restoration. (black and white photo). 1950s photo of second floor rotunda, looking south toward the Senate. Several flags are shown mounted on the rotunda railing. 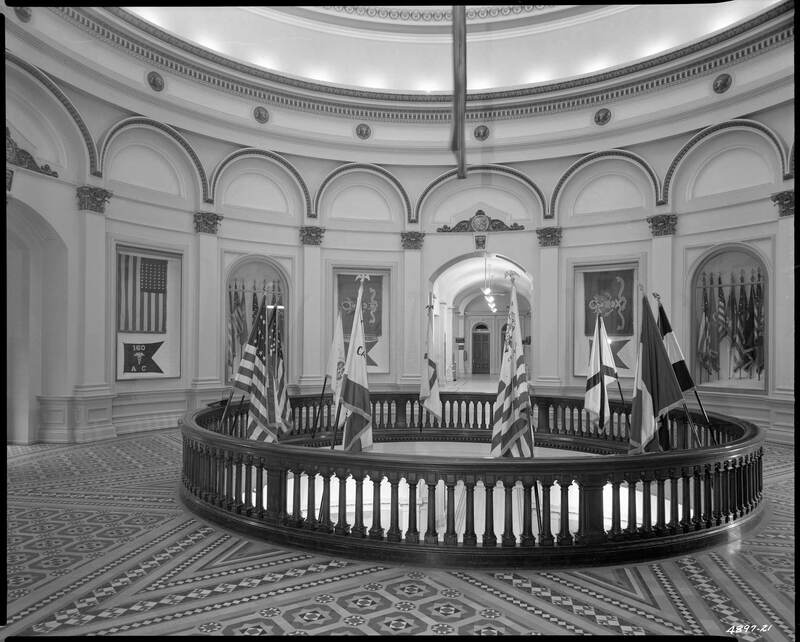 Additional flags are displayed in cases in the rotunda wall niches. 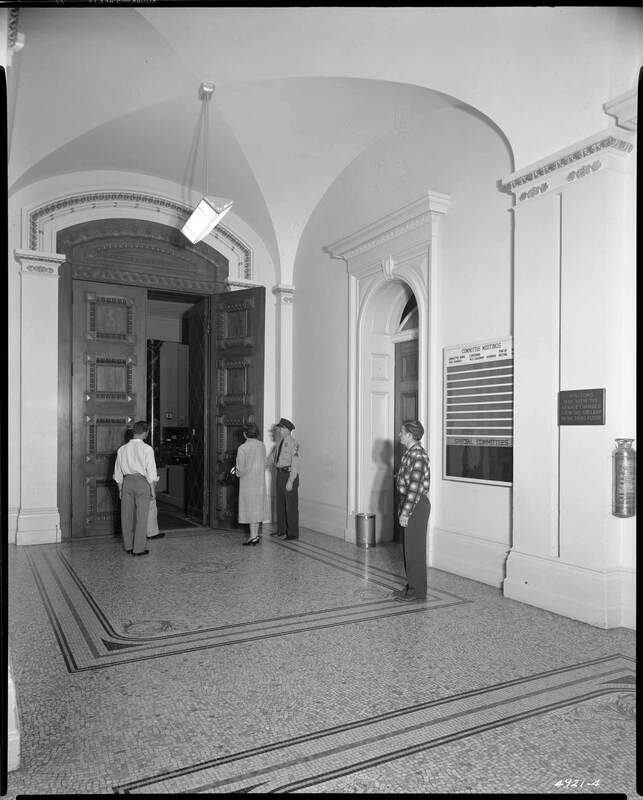 Visible on the Senate side of the rotunda are signs reading: “Women’s Restroom;” “Pacific Telephone Public Telephones;” “Lieutenant Governor;” and “Legislative Bill Room.” (black and white photo). 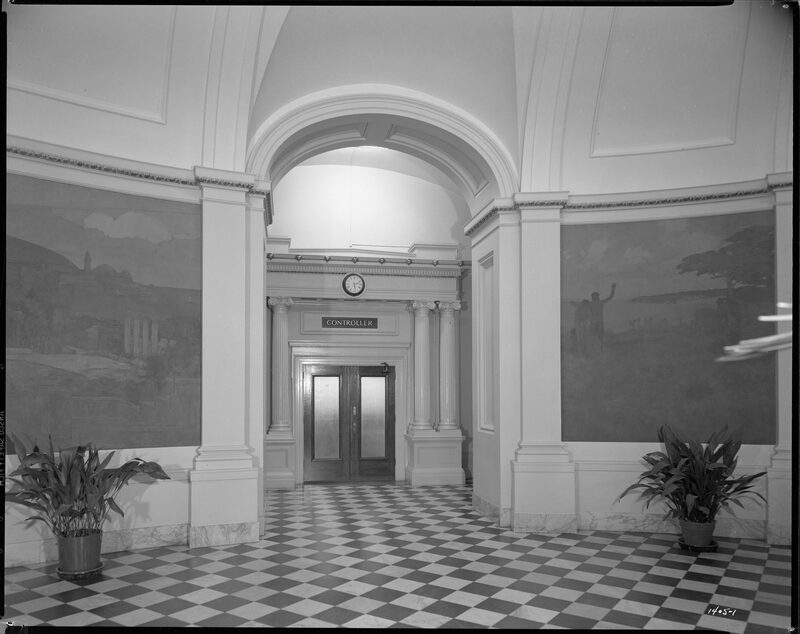 Photo of Capitol Annex hallway circa 1952, looking west toward rotunda. Visible is the silver elevator bank display panel to the right and a State Police officer in hallway to the left. Original glass doorway between rotunda and Annex is also visible in the distance (black and white photo). 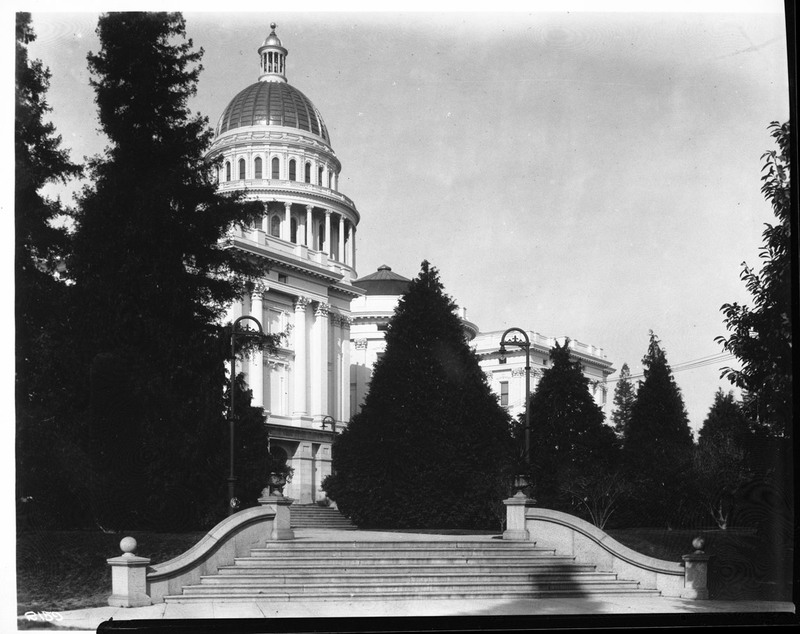 Pre-Annex era photo: exterior view of the western façade of the Capitol building, circa 1930s (black and white photo). 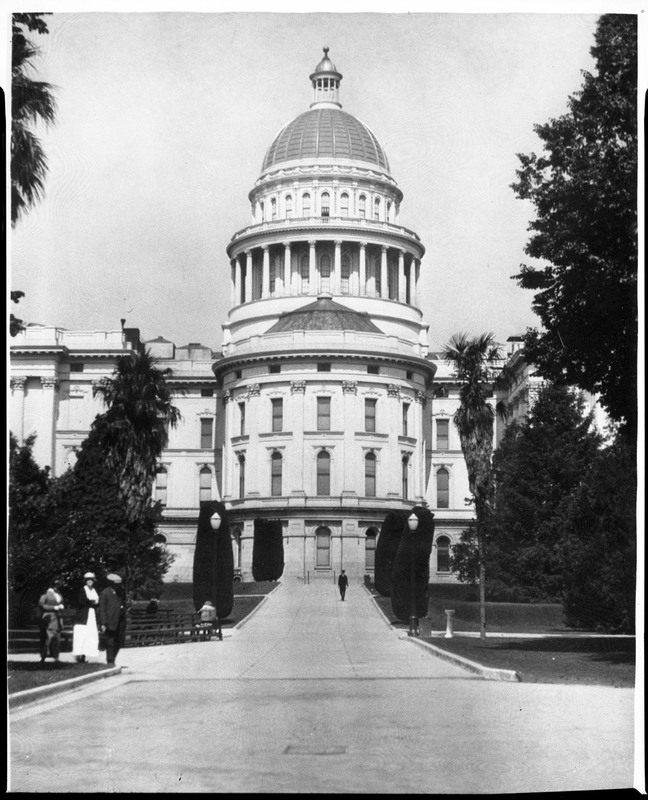 Pre-Annex era photo: exterior view of Capitol building from northeast looking toward Assembly side of building. Terraced landscape is visible in Capitol Park, with steps connecting terrace segments. Numerous park benches and trees are also visible. Man seated on park bench. Man and woman seen walking near Capitol (black and white photo). Photo of Capitol Park looking east toward 15th Street, circa 1948. 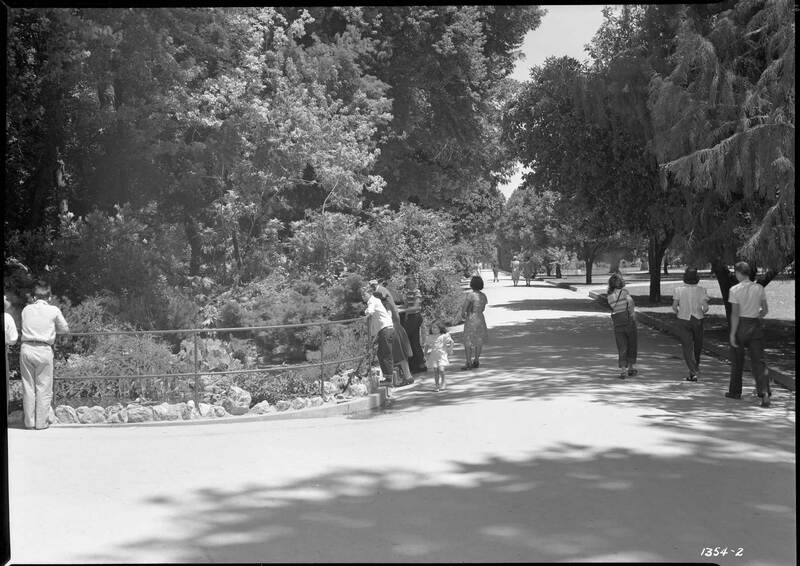 Visitors are seen strolling through the park, and some are gazing at the fish pond, peering over the railing. Park foliage and walkways are visible. 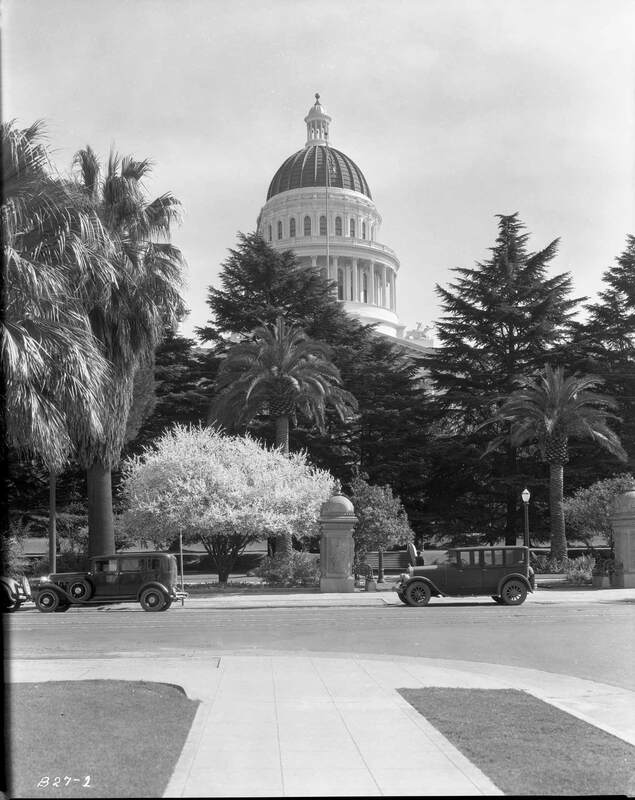 Photo taken from atop the Capitol apse looking east toward Capitol Park, circa 1948. Lush foliage and the treetops are clearly seen from this aerial perspective. Minimal building skyline is evident to the east. Walking paths and lamp posts are visible. 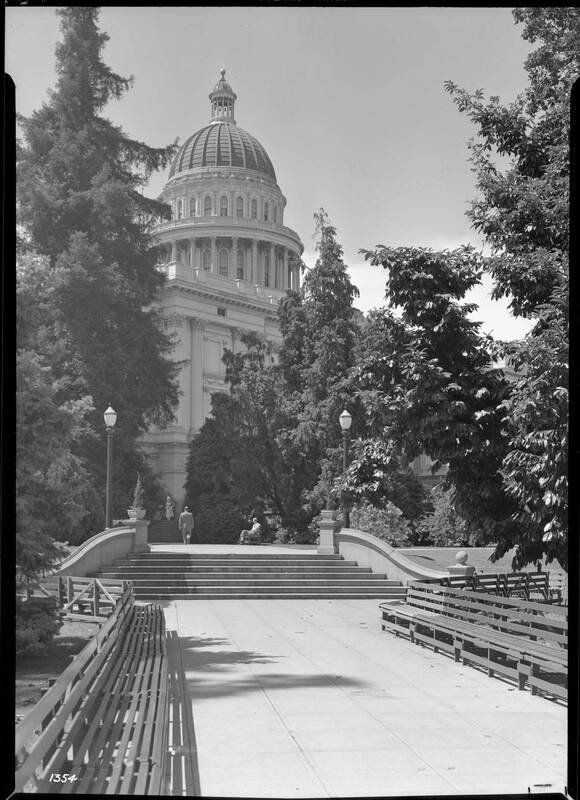 State photo lab photographers documented the Capitol area prior to demolition of the apse in the late 1940s. 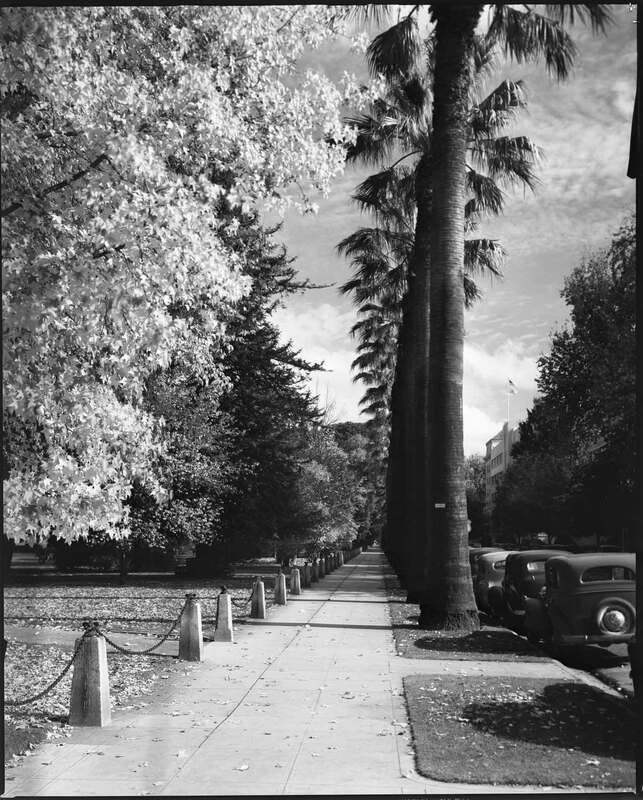 View of eastern Capitol Park looking eastward on center walking path toward 15th Street, circa 1948. Visible is a small sundial mounted on a stone; people walking through the park; running sprinklers; and a wooden tower structure on wheels in the distance, near 15th street (black and white photo). View of southern edge of Capitol Park looking east along N Street. Vehicles seen parked along curbside next to row of palm trees. Iron chain fence and stone balustrade structure is visible as it rings around the park perimeter. The fence, in place since the 1881, was removed when the Annex was constructed in the 1950s. 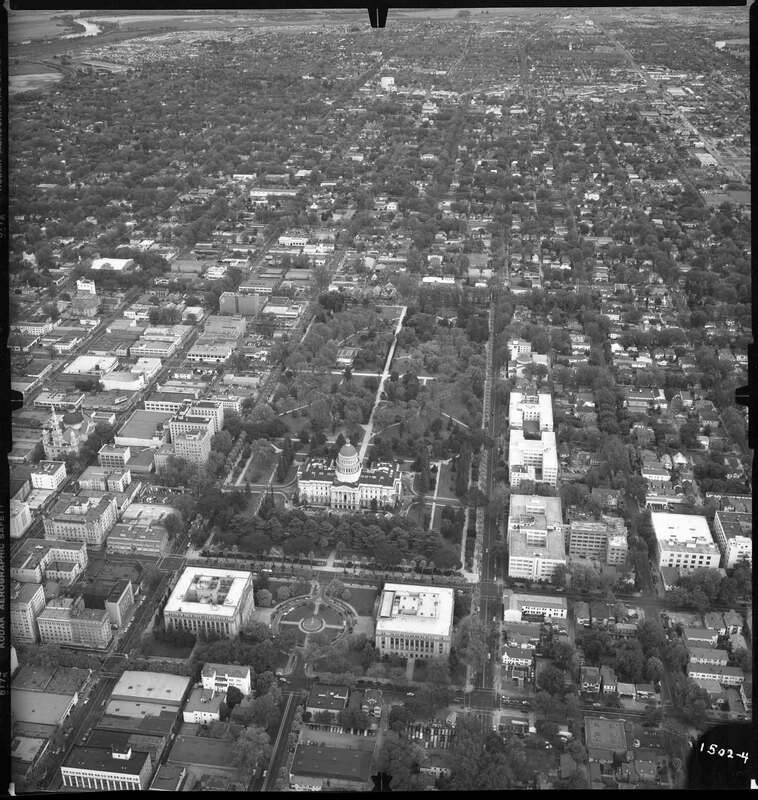 Aerial view of Capitol and downtown Sacramento, circa 1948. Visible are homes, businesses, and office buildings. Construction of annex to 1100 N Street state office building is visible to the south of the Capitol. Also visible: entire Capitol Park; Senator Hotel; gas station at 13th and L Streets; a circular drive-in restaurant at 16th & K Streets; Memorial Auditorium; and the Alhambra Theatre in the distance. (black and white photo). 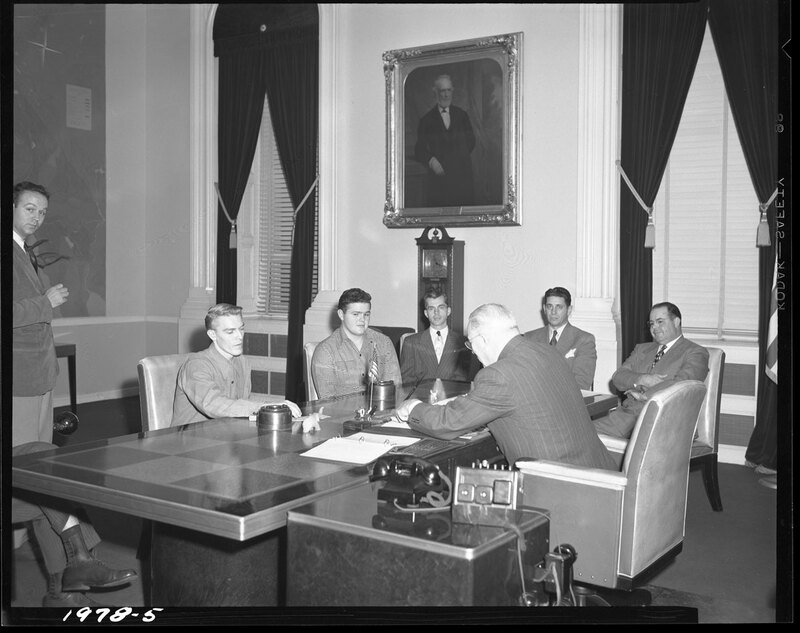 Photo of Governor Earl Warren meeting with 6 adults in his office, circa 1948. Governor is seen seated at his large desk, with five men seated across from him, and one man standing. Visible is a 1940s era phone and intercom system to the Governor’s left. Hanging on the wall is a portrait of California’s first Governor, Peter Burnett. Two small elephant figurines are on the desk. Desk appears to have checkered pattern inlay. Grandfather clock is stationed beneath Burnett portrait. 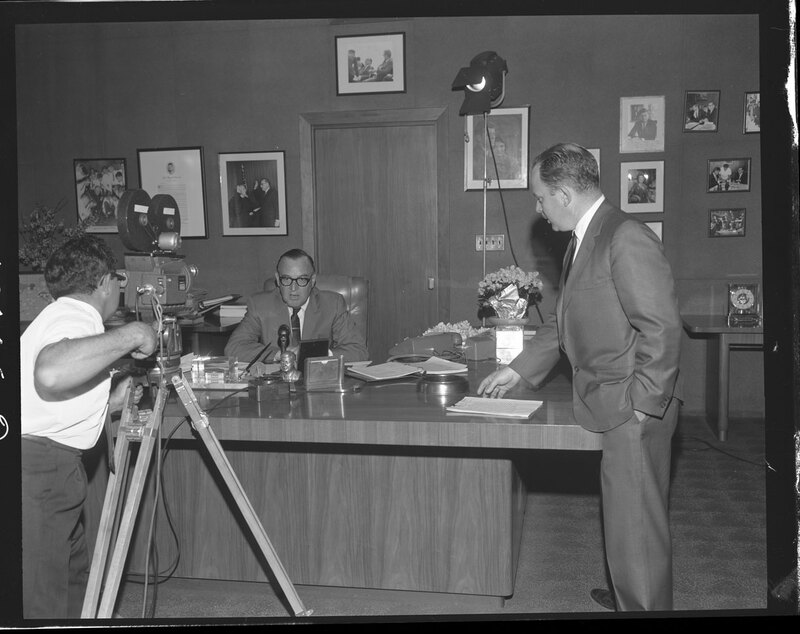 Image of Governor Edmund G. “Pat” Brown, sitting at his desk during what appears to be a televised address, circa early 1960s. Film crew with tripod and camera is visible. 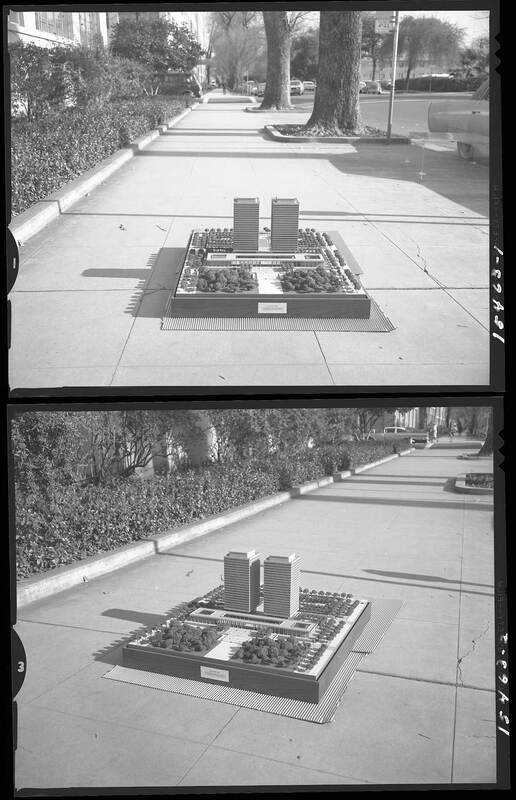 Black and white photo showing scale model of legislative twin towers Capitol building, circa early 1960s. The proposal to replace the old Capitol with twin towers was initiated by Senator Randolph Collier. 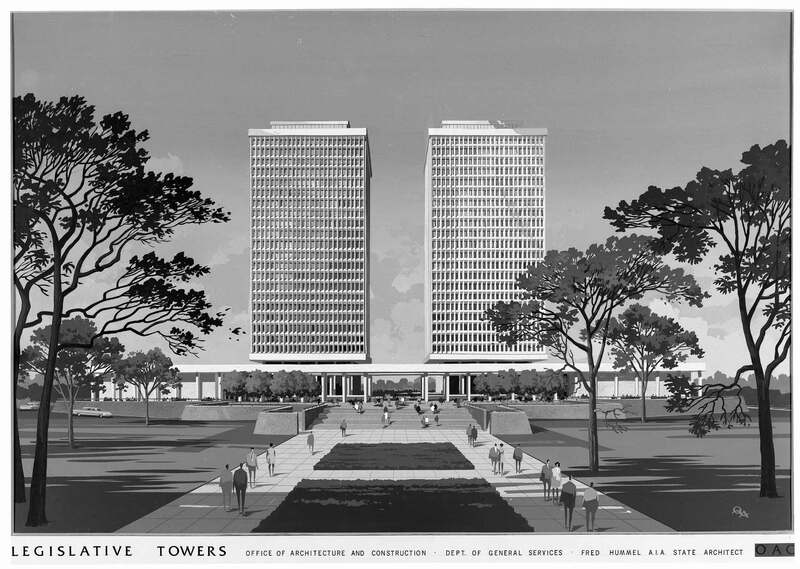 Black and white architectural drawing of the Legislative Towers proposal in the early 1960s. Office of Architecture and Construction is noted on the border. Image shows a tower for each house. 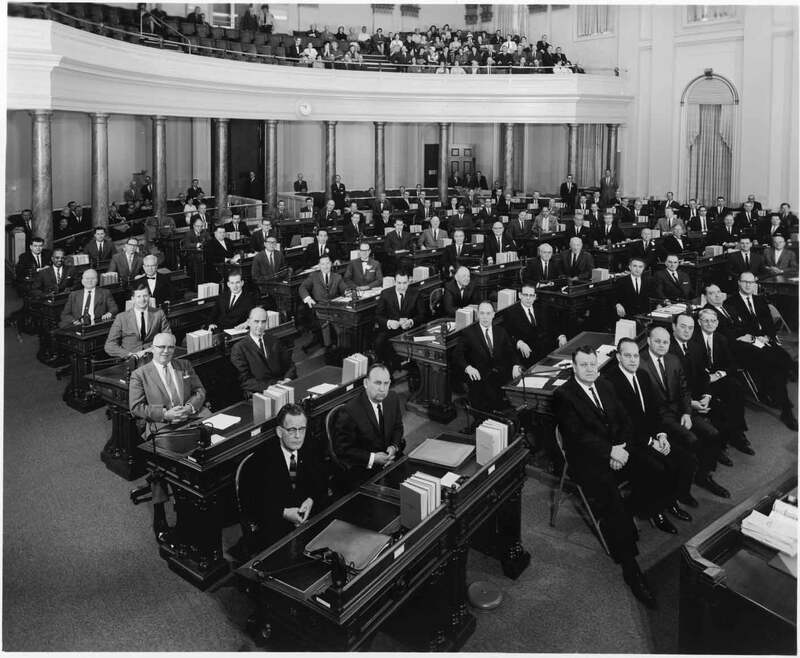 Assembly in session, circa 1963. 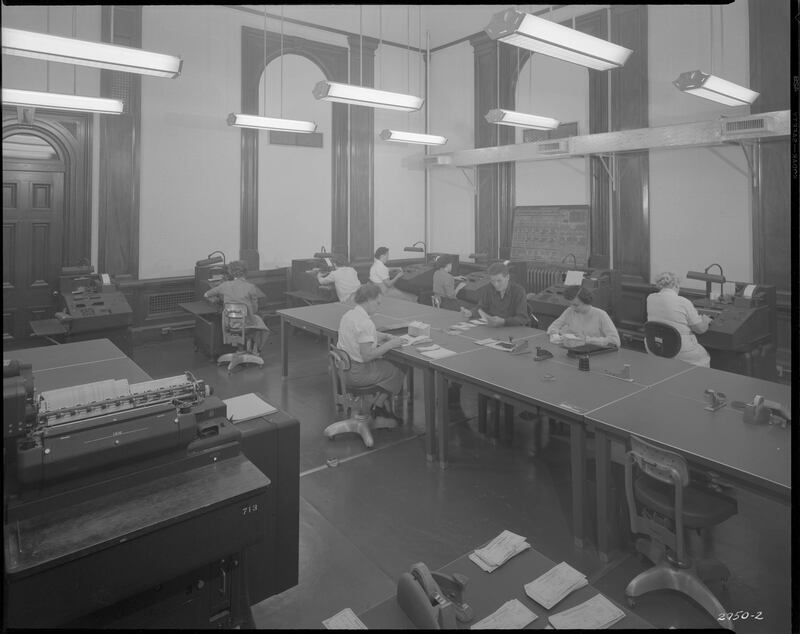 Photo shows members seated at their desks. Speaker Unruh and Assembly Members Knox, Marks, Garrigus, Mills, and others seated in front on folding chairs. 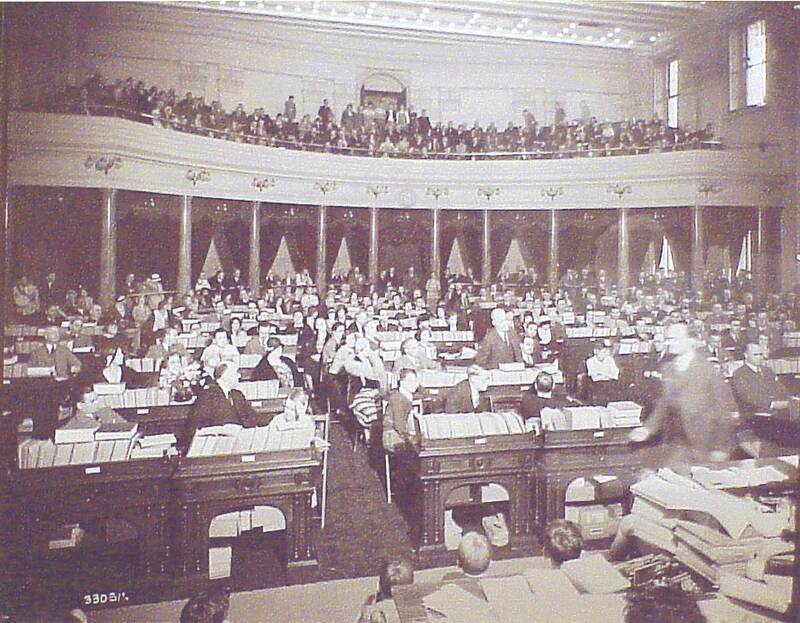 Photo of Harvey S. Firestone, Sr. addressing the State Assembly in session on April 5, 1929. Speaker Edgar Levey present at rostrum. Members are seated at their desks, which are piled with paperwork and books. 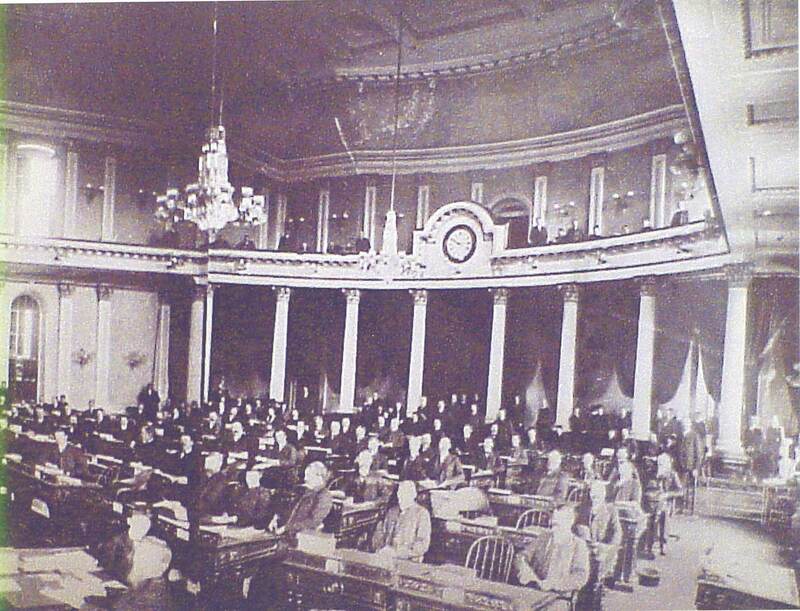 Photo of Assembly in session circa 1900. 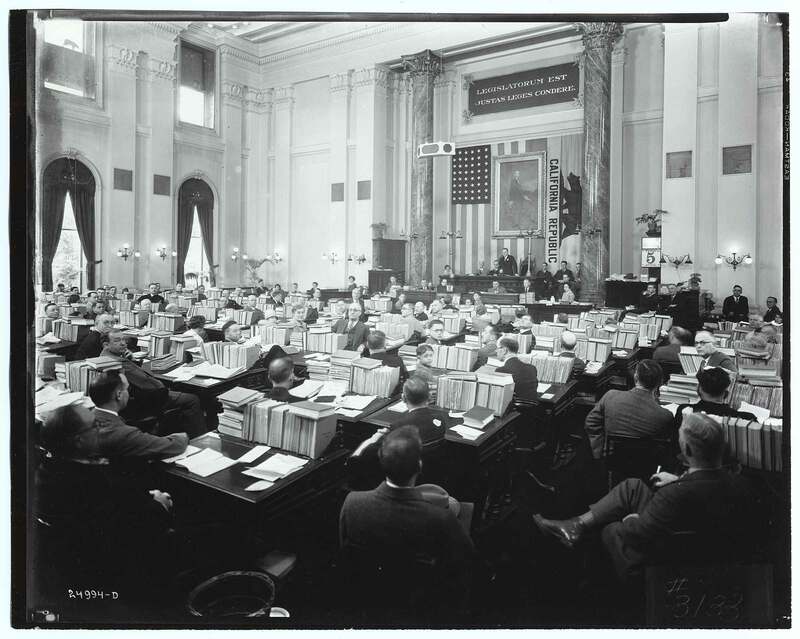 Photo of Assembly in session circa 1920s. 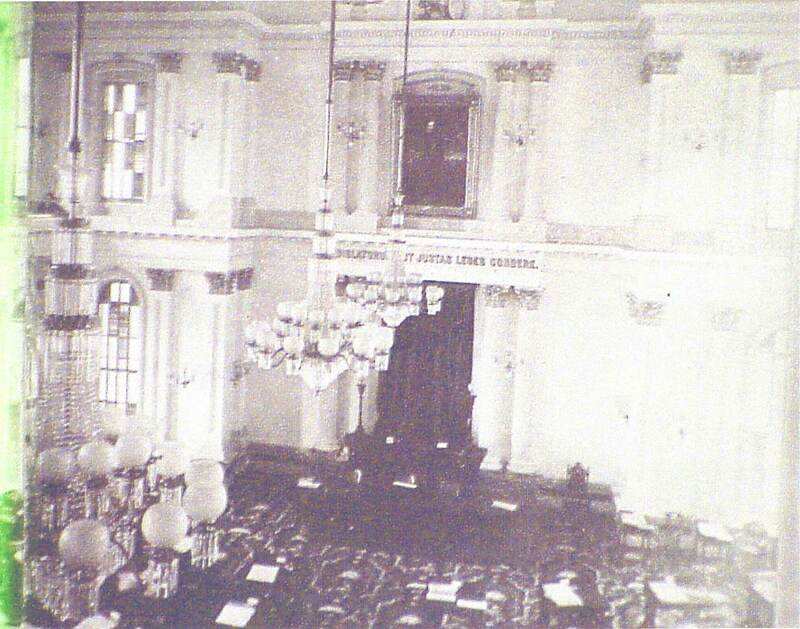 Photo of newly constructed Assembly Chamber in December 1869. 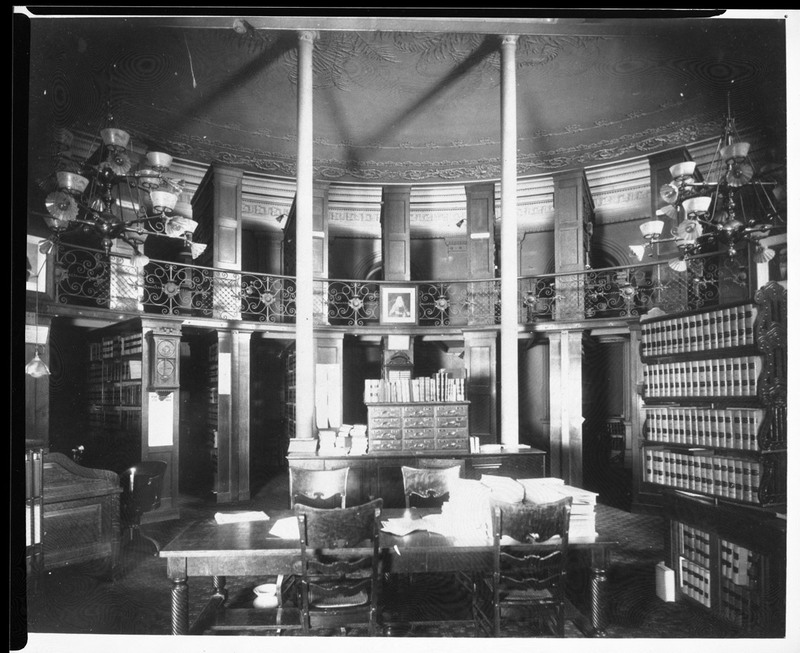 Photo of interior of State Library when it was housed in the State Capitol apse. 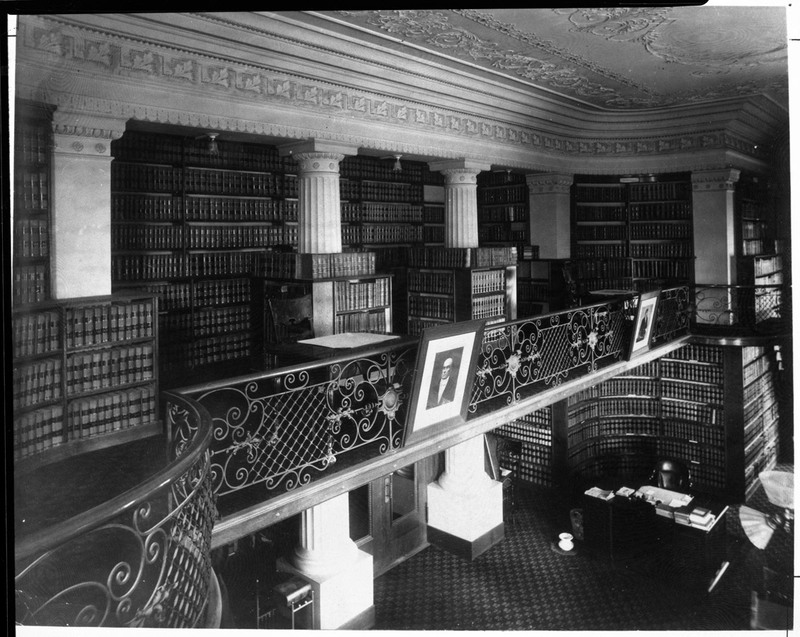 Photo shows book stacks and two levels of library. 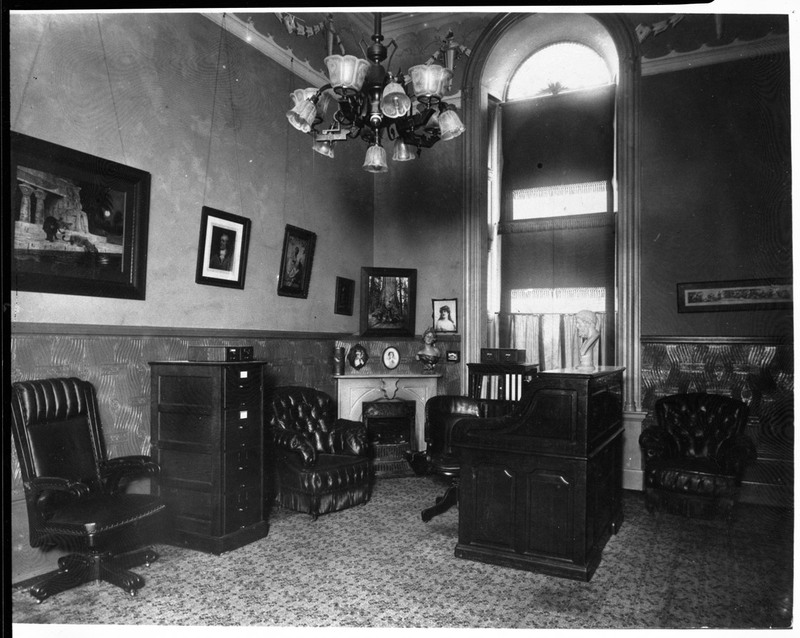 Photo of an office in the Capitol building. Appears to be turn of the century, circa 1900. Rare photo of the interior of the apse rotunda. State library is visible. View of the State Capitol from the southeast (approx. 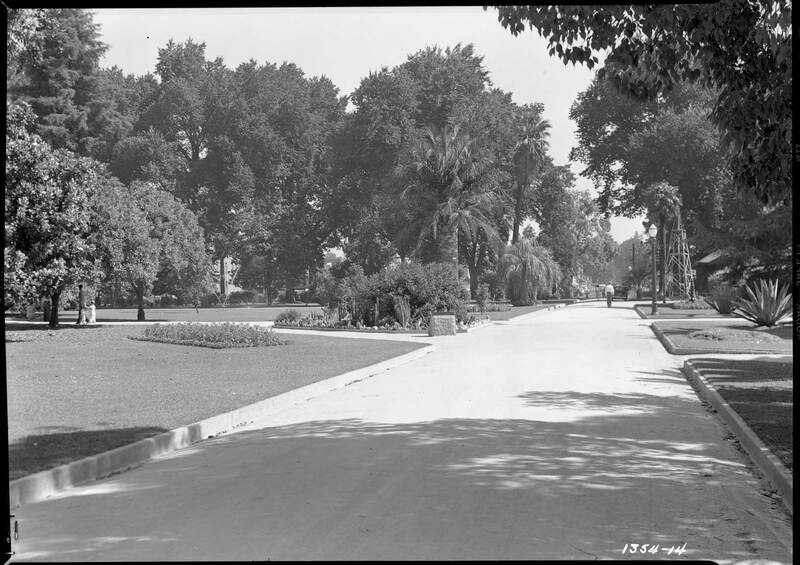 12th and N Streets), showing large staircase leading up the terraced grounds of Capitol Park toward Capitol building. Circa 1940. Interior view of the apse, showing the State Library. Circa early 1900s. Early 20th century photo of Capitol apse, taken from center walkway in east Capitol Park. Citizens are seen strolling the grounds. 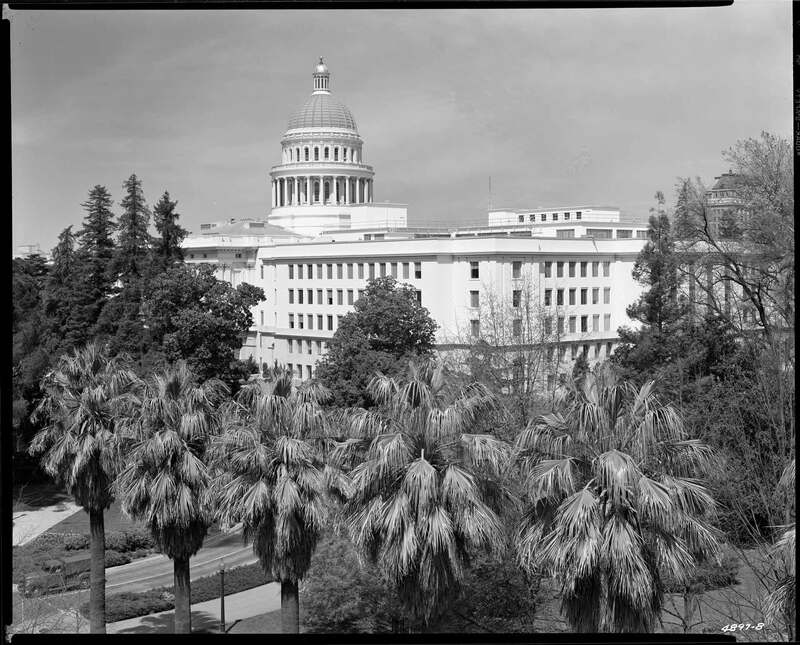 View of the Capitol complex showing old Capitol and newly constructed Annex, circa 1952. Photo taken from top of state building at 12th and N Streets. Rare image showing Controller’s office in the Capitol building in 1952. Workers are seen processing checks and using 1950s era office equipment. 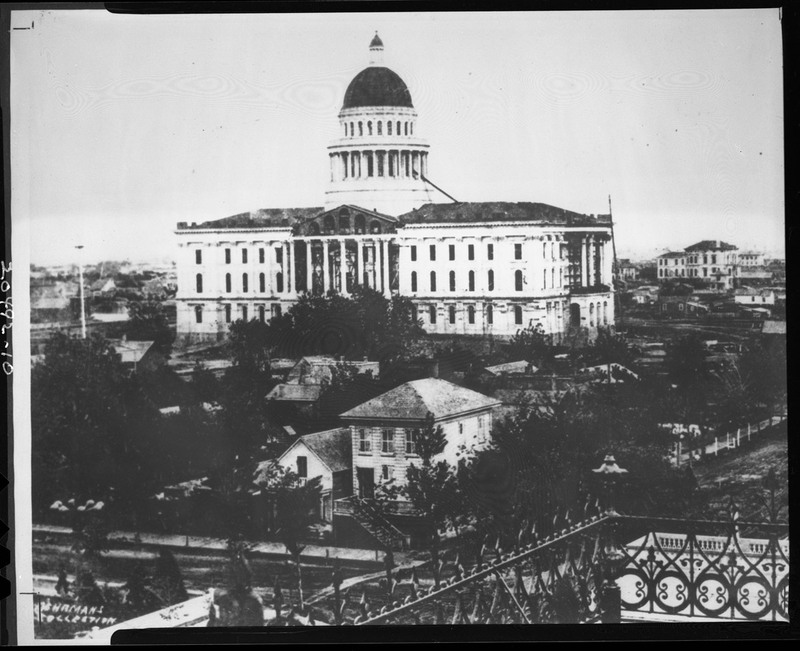 Photo of Capitol building under construction in the 1860s. Photo taken from atop the Stanford Mansion (mansion’s ornate roof railing visible in foreground). Interior photo of the apse showing State Library. Circa early 1900s.